That approach is really pretty successful, but the trick remains on the motor. If you have a 3v motor you're either going DCC for voltage control and need room for a receiver, need a resistor in series with the 3v motor (which has it's own control issues) or you need to repower with a 12V motor. If you're sucking up space anyway, I vote for the 12V motor if you can make it work. If running on DC, you could use a pair of zener diodes (or one bi-directional part) in series with the 3V motor. That might help with power pick-up issues somewhat since you'd have 9-12V on the rails instead of 3V or less. Too bad that those vertical-motor critters cannot have double gear reduction (worm directly drives the wheelset ). Those small motors (even ran at their nominal voltages) have relatively high RPMs, which makes those models (like Chris mentioned) rockets-on-wheels. Just when you thought that Kato N scale locos were speed demons . . . I've also played with this kind of drive, and you certainly get the speed control out of it if you can fit it all in what you're trying to do. I couldn't fit this in the 25-tonner but you 'might' be able to fit it in the concept you're looking at. The spur gear reduction works, but tends to be noisy. These were really expensive, over $100. I played with an early version of one on Z scale wheels gauged to N and it was pretty much a failure as it fell in every switch frog I had. It desperately needed wider treads. My attempt to put wider-tread wheels on it was pretty much of a failure, and it wouldn't fit in what I wanted to make anyway. Yes, these really can be rockets. It seems like the smaller the motor the higher the RPM. I've done really well with a series resistor on 3V motors if they had gearhead reduction, because the load/torque curve is flattened out so that the resistor doesn't do as much as the motor current draw is much more constant. But at low RPM and near-stall conditions on a 3V motor to actually pull a load, the resistor takes it on the chin and rapidly heats. That's why Kato dumped the 3V motor early on in the design. If you look at the 11-105/6/7 chassis, the legacy circuit board to hold the 100-ohm resistor is still in there, unused. The last 'really good' critter I built was the TP56 on the EMD SD truck, where both Ron Beardon and I built our own versions. Ron was a straight motor/worm drive on a Kato Phase 2 SD40 truck, mine was a gearhead mount on a legacy Roco E-unit truck with offset gear tower. Mine probably had better low speed and torque but it was such a bear otherwise that I declared Ron the clear winner of the challenge. I have a nasty habit of picking up a test copy of just about all of these tiny 4-wheel chassis, I have yet to see one that I think has all the features I'd want to see here to make it really worthwhile and practical. One of the key lacking features is at least minimal equalization to keep all four wheels in contact with the rail for electrical pickup. My first 25-tonner was built that way, and it was just a bear to tune for weight distribution. The one that's closest to being 'perfect' may yet be the Searails one new production, we'll see. As mentioned, a diode circuit can be used to power sub-3-volt motors. But these motors really need double-worm-reduction at a minimum to bring the speeds into an acceptable range. Yeah double worm drive! If the worm has 15 teeth and the motor is mounted right to the axle. Then the gear ratio is 15:1. Add another 15 tooth worm and rotate the motor, now the ratio is 75:1 and that is just about perfect. Of course like Randy says you need to pick up power smoothly as well. I just wanna see you build it! Long ago I really wanted that LI 403 boxcab I posted. I even started etching (at home) the 4 walls, but never got any further. Of course like Randy says you need to pick up power smoothly as well. Chris, do you still have that drive you made with the articulated axle? Or, at the very least, photos of it? My miniature power efforts are long past due. It's coming, really. This 3D stuff is letting me progress nicely on the peripheral stuff which was a real holdup for me. The mechanism and methods are well figured out and tested. Maybe this is your starting point? Still waiting eagerly for those chassis. Especially if you can do a few different wheelbases. Other than a couple Nn3 projects, I've got a number of standard gauge projects that need a reliable and compact mechanism. 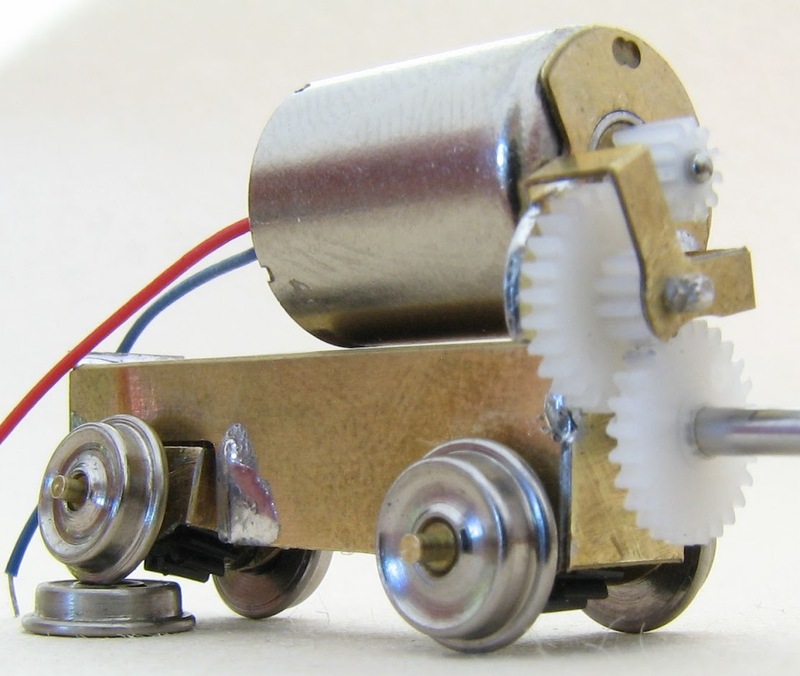 "Derry is the only word in the English language with 6 silent letters"
I think those were gears from a servo. Has a 82:1 gear ratio. Nothing in the eBay listing's photos or description shows anything other than standard single-stage worm gear reduction (with vertically-mounted motor). The gear reduction in the one I showed in my older video was 150:1. The small motors are generally higher RPM than what we're used to seeing. MUCH higher (it's the source of their power because they sure don't have any torque to speak of). Therefore they need a larger gear reduction to run with slow speed control or worst case, to run at all. Like trying to start your car from a dead stop in high gear. It's exactly the same principle and also part of why they really won't run well at slow speed and then when they do get going, they take off like a bullet. Just like if you coaxed your car to roll from a stop in too high a gear. And that RPM with enough gear reduction is what lets them work at that small size. It's straight up Horsepower principles at work. Nothing fancy. And no, I haven't seen any commercially available miniature chassis that gets close to this. And when considering the gearing the whole story is incomplete until you've factored in the wheel size, an integral element of the final drive ratio. For the motors small enough to get this to work nicely Chris's unit at 82:1 and if it had smaller wheels (I assume they're 33") is about the barest of bare minimum to me and 100:1 or better and that's with 24" wheels, is where I like to be, depending on the application's desired top speed. That's where I find the sweet spot is. So if there's anything to what I just outlined and you realize that most of those small units have somewhere around 14:1 or maybe in one with compound reduction, maybe 36:1, then driven through 36"? 40"? wheel diameters, then it's obvious what the result will be and proven again every time it's tried. Now, worthy of note, @randgust has utilized some of those chassis successfully WHEN he married them up to a 4:1 planetary gear reduction motor. So, 14 to 36 x 4 = ? And there you have it, again, and as just outlined. Now the question is, do you have the room for the extra planetary? If so, go for it! It will work well. This is part of what took me so long from the day I started on my mine loco project and with a full understanding of the challenge. Well, pretty full understanding as it proved even tougher than I had anticipated. It wasn't getting it done, it was getting it done in an even smaller package than ever... and with some weight to it. it, but man that thing is loud. Needs some top shelf insulation. Gear reduction is aways louder. I remember as a young HO Scale modeler, I was really proud putting the infamous Ernst Gears in my Athearn Blue Box SW-7 converted to an SP SW-1500 with a Cary all metal shell. Those things were heavy and loud, but they could pull a stump.